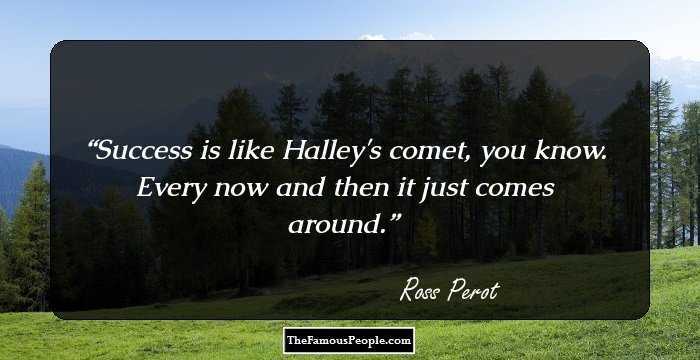 A collection of quotes and thoughts by Ross Perot on sports, country, responsibility, jobs, people, strength, success, business, politics, and life. 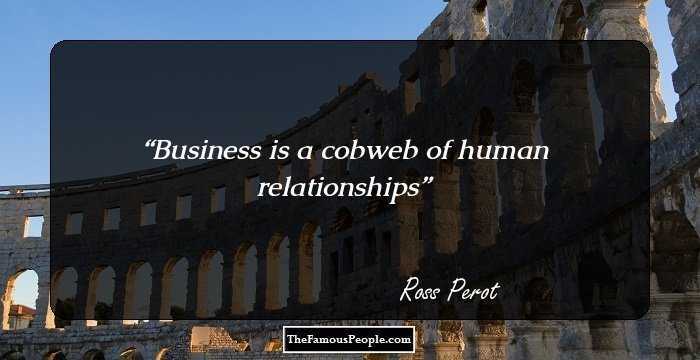 Ross Perot is an American former politician and business magnate. Renowned for his entrepreneurial success, Perot ran a non-partisan presidential campaign in 1992. 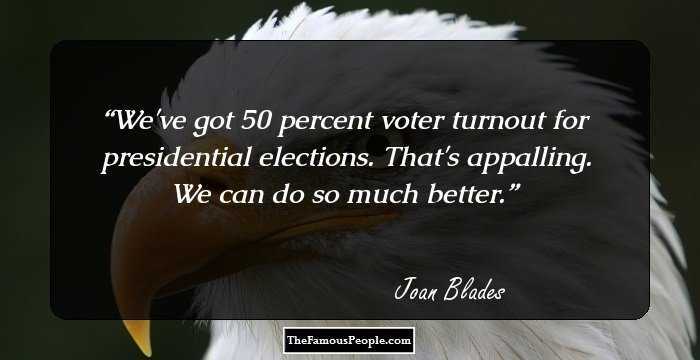 In 1996, he ran a third party campaign and both campaigns have gone down in the United States history as one of the strongest presidential showings by an independent candidate or a third party. He earlier worked as a salesman for IBM, and founded his own company after leaving IBM. 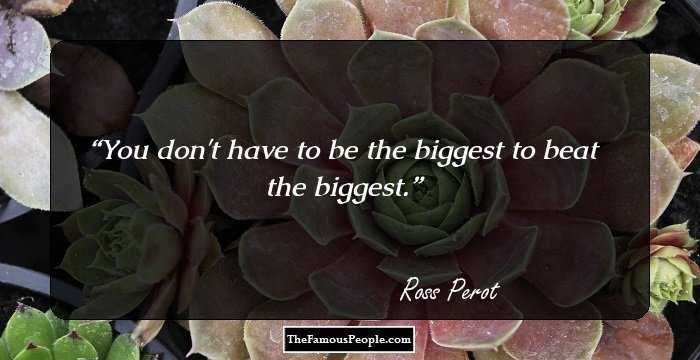 We have rounded some inspiring quotations and sayings by Ross Perot, which have been extracted from his speeches, campaigns, works, interviews, thoughts, and public utterances. Read through the thoughts and quotes by Ross Perot on leadership, failures, fundamentals, school, arrogance, teaching, pain, economy, etc. 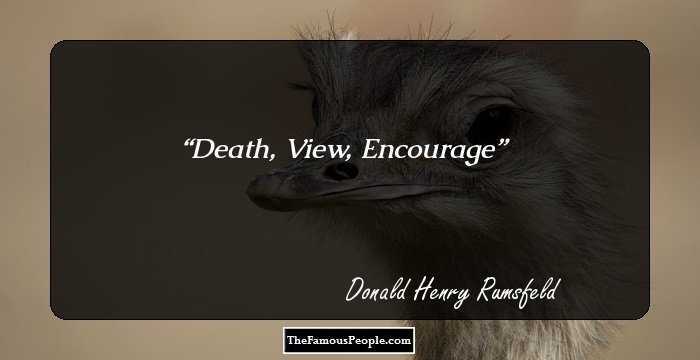 for your daily dose of inspiration. Generosity is something we learn, from our parents, schools and community. You don't have to be the biggest to beat the biggest. 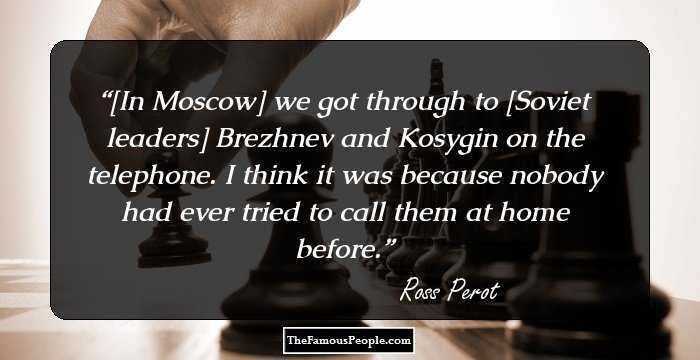 [In Moscow] we got through to [Soviet leaders] Brezhnev and Kosygin on the telephone. I think it was because nobody had ever tried to call them at home before. We have to succeed, so we will. The one thing I know through experience ... is that people don't know why they come to work until they don't have to come to work. Big is not beautiful. Big is inefficient. The first EDSer to see a snake kills it. At GM, first thing you do is organize a committee on snakes. Then you bring in a consultant who knows a lot about snakes. Third thing you do is talk about it for a year. Revitalizing General Motors is like teaching an elephant to tap dance. You find the sensitive spot and start poking. Japan is our rival, not our enemy. Japan is a competitor... Bashing a Toyota won't make a better car. A weak currency is the sign of a weak economy, and a weak economy leads to a weak nation. I love this country, I love the principles on which it's founded. I was born rich. Not in tangible things... but rich in the parents I had. If we did not have such a thing as an airplane today, we would probably create an agency the size of NASA to build one. The American dream. Those three short, simple words encompass the hopes and aspirations of all the peoples on earth. The words are not only short and simple. They are also fragile. 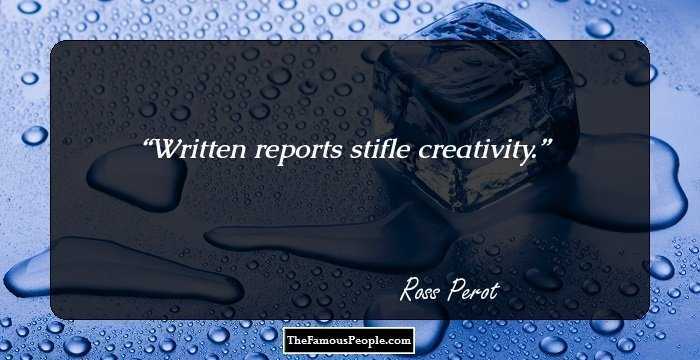 Punishing honest mistakes stifles creativity. I want people moving and shaking the earth and they're going to make mistakes. This planet is our home. If we destroy the planet, we've destroyed our home, so it is fundamentally important. Modern politics has become little more than shirking responsibility and blaming somebody else. 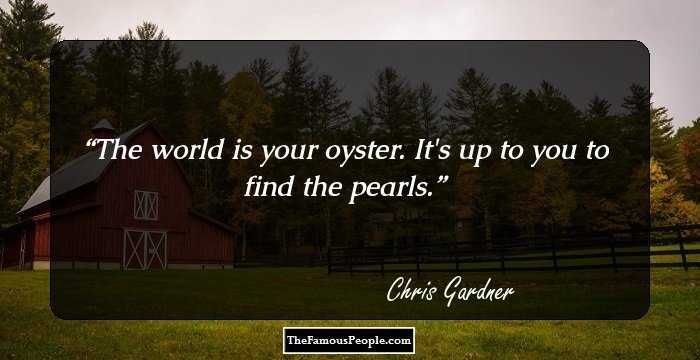 My role in life is that of the grain of sand to the oyster-it irritates the oyster and out comes a pearl. One voice is tiny, and alone it cannot be heard above the din of politics as usual. The peoples voice, when it cries as one, is a great roar. Don't run your life by what's legal or illegal. Run your life based on what's right or wrong. Most new jobs won't come from our biggest employers. They will come from our smallest. We've got to do everything we can to make entrepreneurial dreams a reality. I honestly believe I'd make one of the worst elected officials in the history of this country. The best way to make money is not to have money as your primary goal. I've seen great people come into the business world primarily motivated to make money. Almost without exception they failed. Talk is cheap. Words are plentiful. Deeds are precious. It is the individual's ability to deal with the unexpected that characterizes the difference between success and failure. 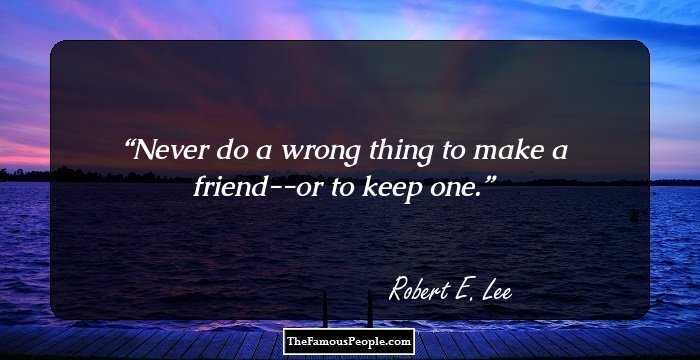 Never ask anyone to do what you haven't done before and wouldn't do again. That's a pretty fundamental rule in leadership... treat them like you treat yourself. Things you don't like, they don't like. The most successful people in the world aren't usually the brightest. 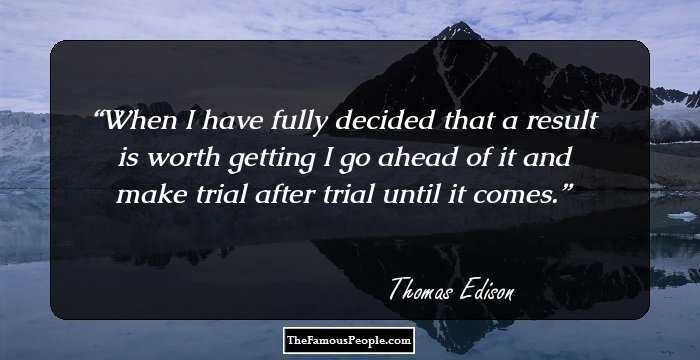 They are the ones who persevere. I came from an environment where if you see a snake, you kill it. At General motors, if you see a snake, the first thing you do is to hire a consultant on snakes. The debt is like a crazy aunt we keep down in the basement. All the neighbors know she's there, but nobody wants to talk about her. In business, people are held accountable. In Washington, nobody is held accountable. In business, people are judged on results. In Washington, people are measured by their ability to get reelected. If we really want to know who is responsible for the mess we're in, all we have to do is look in the mirror. You and I own this country, and we are responsible for what happens to it. When building a team, I always search first for people who love to win. If I can't find any of those, I look for people who hate to lose. Action is greater than writing. A good man is a nobler object of contemplation than a great author. There are but two things worth living for: to do what is worthy of being written; and to write what is worthy of being read. We must return immigration to a logical, orderly process where people fill out their applications and wait for approval. We must make sure illegal immigrants stop storming our borders. We must establiesh the correct criteria, such as our need for certain job skills or education, for granting the right to immigrate into the United States. Something in human nature causes us to start slacking off at our moment of greatest accomplishment. As you become successful, you will need a great deal of self-discipline not to lose your sense of balance, humility and commitment. Keep in mind our Constitution predates the Industrial Revolution. 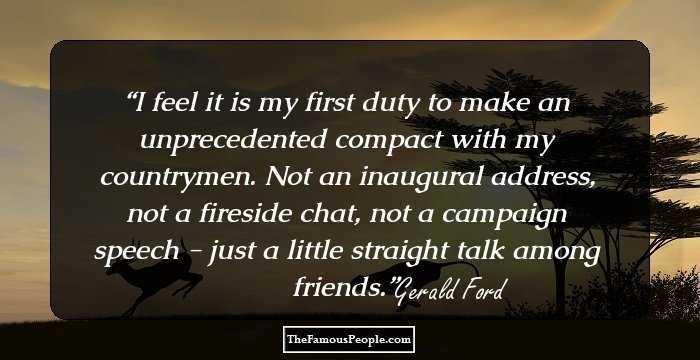 Our founders did not know about electricity, the train, telephones, radio, television, automobiles, airplanes, rockets, nuclear weapons, satellites, or space exploration. There's a lot they didn't know about. It would be interesting to see what kind of document they'd draft today. Just keeping it frozen in time won't hack it. Guys, just remember, if you get lucky, if you make a lot of money, if you get out and buy a lot of stuff--it's gonna break. You got your biggest, fanciest mansion in the world. It has air conditioning. It's got a pool. Just think of all the pumps that are going to go out. Or go to a yacht basin any place in the world. Nobody is smiling, and I'll tell you why. Something broke that morning. The generator's out; the microwave oven doesn't work . . . Things just don't mean happiness.